The objective of this study was to evaluate the role of splenectomy in decreasing the transfusion needs in thalassemia patients. Thalassemia can cause significant complications, including iron overload, bone deformities, and cardiovascular illness. In thalassemia, spleen is the most commonly affected organ as seen from the incidence of splenomegaly, due to excessive destruction of abnormal red blood cells, extramedullary hematopoiesis, and transfusional overload. This investigation is designed as a prospective study in which 15 patients with thalassemia major underwent splenectomy under both open and laparoscopic techniques. Patients were selected from the outpatient clinic of the General Surgery Department and were followed up for 1 year after surgery. Patients underwent open splenectomy (47%) and laparoscopic splenectomy (53%). The operative complications were bleeding (13%) and injury to the spleen during port insertion (6%). After splenectomy, the patients were followed up for 1 year. All patients showed an improvement in hemoglobin and hematocrit levels. Also, all the blood elements – red blood cells, white blood cells, and platelets – showed a significant increase after splenectomy in all patients. Splenectomy definitively reduced blood requirements for thalassemia patients from twice every month preoperatively to less than once per month, with improved hemoglobin levels. These improvements are sustained over a prolonged period of time. Thalassemia is a form of inherited autosomal recessive blood disorder that originated in the Mediterranean region. These disorders lead to weakening and destruction of red blood cells (RBCs), which results in microcytic anemia . Thalassemia is particularly associated with people of Mediterranean origin, Arabs, and Asians. Maldives has the highest incidence of thalassemia in the world, with a carrier rate of 18% of the population. The estimated prevalence is 16% in Cyprus, 1% in Thailand, and 3–8% in Bangladesh, China, India, Malaysia, and Pakistan. There is prevalence of thalassemia in descendants of people from Latin America and Mediterranean countries. A very low prevalence has been reported from people in Northern Europe (0.1%) and Africa (0.9%), with those in North Africa having the highest prevalence . Thalassemia can cause significant complications, including iron overload, bone deformities, and cardiovascular illness. However, this same inherited disease of RBCs may confer a degree of protection against malaria (specifically, malaria caused by Plasmodium falciparum), which is or was prevalent in the regions where the trait is common. This selective survival advantage of carriers (known as heterozygous advantage) may be responsible for perpetuating the mutation in populations. In that respect, the various thalassemias resemble another genetic disorder affecting hemoglobin (HB), such as sickle cell disease . People with thalassemia traits do not require medical or follow-up care after the initial diagnosis is made. People with β-thalassemia trait should be warned that their condition could be misdiagnosed as the more common iron deficiency anemia. They should avoid routine use of iron supplements; yet iron deficiency can develop during pregnancy or from chronic bleeding. Counseling is indicated in all persons with genetic disorders, especially when the family is at risk of a severe form of disease that may be prevented. People with severe thalassemia require medical treatment. In thalassemia patients, packed cell transfusions have improved survival but transfusions also have their own complications of iron overload; thus iron-chelating agents are given concurrently with transfusion . In thalassemia, spleen is the most commonly affected organ, as seen from the incidence of splenomegaly due to excessive destruction of abnormal RBCs, extramedullary hematopoiesis, and transfusional overload. Splenomegaly further increases transfusional requirement. Splenectomy is indicated in the transfusion-dependent patient when hypersplenism increases blood transfusion requirement and prevents adequate control of body iron with chelating therapy. An enlarged spleen without an associated increase in transfusion requirement is not necessarily an indication for surgery. Patients with hypersplenism may have moderate to enormous splenomegaly, and some degree of neutropenia or thrombocytopenia may be present . There is a debate on the benefit of splenectomy in decreasing the rate of blood transfusion. Some authors believe that its vascular and septic complications are greater than its benefits. Some authors believe that splenectomy should be avoided unless absolutely indicated, whereas others believe that its complications can be avoided if the patient is well prepared . Thus in this research we will focus on the changes in the blood transfusion needs and in the blood component values after splenectomy in thalassemic patients, trying to determine the best management strategy to improve their life. The present study is a prospective cohort study. All participants were subjected to history taking for personal, past, and family history. Patients underwent clinical examination in the form of general and local breast examination and routine laboratory investigations. Fifteen patients with thalassemia major were included in this study. They were selected from the outpatient clinic of the General Surgery Department and were prepared to undergo splenectomy. The study was carried out after obtaining approval from the ethics committee of the Faculty of Medicine and written consent from patients' parents. All patients underwent detailed personal and medical history taking. History of hemorrhagic diathesis attacks, history of generalized lymphadenopathy, incidence of recurrent infections, history of previous surgical operations, especially surgery of the upper abdomen, history of liver and kidney diseases, and history of blood transfusion were considered. All patients were subjected to a thorough examination for vital signs, nutritional status, fitness for surgery, manifestations of hemolytic disorders, signs of bleeding tendency, and general assessment of all systems of the body. All patients were subjected to local abdominal examination for organomegaly, ascites, abdominal hemorrhagic peticae, scars of previous operation, divarication of recti, and ventral hernias or associated intra-abdominal diseases. All patients were subjected to laboratory investigations for liver function tests, blood urea and serum creatinine, complete blood picture, fasting blood sugar, and coagulation profile. The morphology of the spleen, and its major longitudinal axis, was measured. Any other abdominal lesions such as liver cirrhosis, ascites, or gall stones were documented. Bleeding tendency due to causes other than thalassemia. Patients presenting with an altered blood picture – for example, low HB percentage or reduced platelet count – were prepared before surgery. Packed red cell transfusion was given to anemic patients to elevate their HB concentration to reach at least 10 g%. All patients were vaccinated with polyvalent pneumococcal, meningococcal, and Haemophilus influenzae vaccinations at least 1 week before surgery. Prophylactic antibiotics were given one day preoperatively, usually in the form of parenteral third-generation cephalosporin. All patients were administered general anesthesia with isoflurian or sevoflurian with preoperative analgesic load. As soon as the patients recovered in the recovery room, the nasogastric tube and Foley's catheter were removed. Intravenous fluids were continued until oral fluids were tolerated usually on the next morning postoperatively on recovery of bowel movements. Vital signs and the amount of blood collected in the suction drains were recorded. The suction drains were usually removed on the second or third day postoperatively. Abdominal ultrasonic examinations were performed on any patient with any suspected postoperative collection. Blood transfusion was required postoperatively in the form of packed red cells or whole blood transfusion when severe anemia was present. Thrombocytosis might develop during the first 10 days after splenectomy. It is important to take blood samples to evaluate that condition and treat it with aspirin. Postoperative analgesics were tailored according to patient needs and ranged from NSAIDs to opioids if needed. Gradual withdrawal of steroids in patients showed improvement in their blood components. Any patient who has undergone splenectomy may be in danger of major postsplenectomy sepsis. Careful observation was therefore required and, if present, the condition was treated vigorously. Penicillin was continued until the age of 25 years. The suction drains were usually removed on the second or third postoperative day. Usually the patients were discharged from the hospital on the second or third day postoperatively if no postoperative complications occurred. All patients were followed up in the surgical outpatient clinic for 2 months with special emphasis on surgical site complications such as wound infection or incisional hernias. Complete blood picture was determined in the first 2 weeks to detect the efficiency of the operation and the patients' medical follow-up was continued in the Hematology Department for 12 months. Through the period of follow-up we assessed the changes in HB, hematocrit (HCT), white blood cells (WBCs), RBCs, and platelets before and after splenectomy. 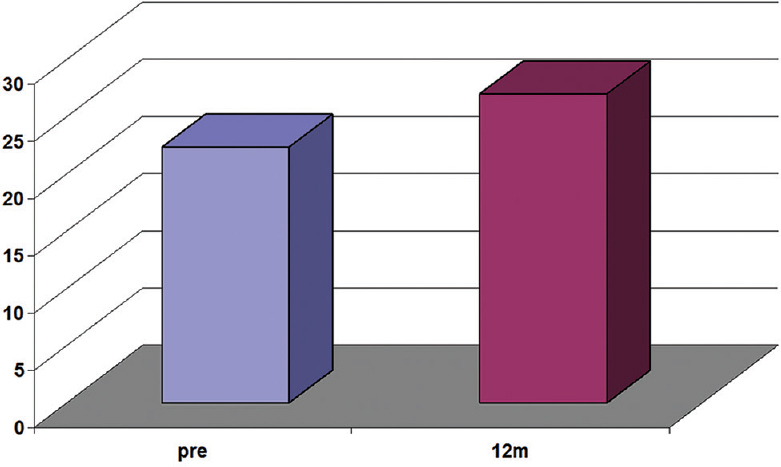 Data obtained from the present study were computed using SPSS, versions 17, under the platform of Microsoft Windows XP, Professional Edition (SPSS Inc., Chicago, Illinois, USA). Continuous data were expressed in the form of mean ± SD, whereas categorical data were expressed in the form of count and percentage. Comparisons of continuous data were performed with the Student t-test, whereas categorical data were compared with the X2-test. P values less than 0.05 were considered statistically significant. The operative techniques are presented in [Table 1]. [Table 2] shows the rate of complications. Bleeding was caused by incomplete ligation or injury to splenic vessels (two cases in the laparoscopic group) and injury to the spleen occurred during port insertion (one case). The latter was converted to open technique to control the bleeding. [Table 3] shows the distribution of accessory splenules. Accessory splenules were found at the hilum in three cases and in the greater omentum in two cases. They were removed with a harmonic scalpel in patients of the laparoscopic group. [Table 4] shows the time of postoperative discharge of patients from the hospital. Seven patients were discharged from the hospital on the second postoperative day, seven were discharged on the third day, and one patient was discharged after 7 days. Preoperative and postoperative laboratory values 1 year after the operation are given in [Table 5]. After splenectomy, our patients were followed up as follows: after 1 month, followed by at 3-month intervals for 1 year (at 1, 3, 6, 9, and 12 months). All patients had complete blood count on follow-up. All patients showed an improvement in HB and HCT levels. Also, all the blood elements – RBCs, WBCs, and platelets – showed a significant increase after splenectomy in all patients. The mean RBC count in the first month follow-up was 3.86 ± 0.78 (t-test = 19.105), which shows a significant increase in the RBC count in the first month after the operation. After 3 months the mean RBC count was 3.94 ± 0.72, which shows another significant increase from the previous follow-up visit. After 6 months the mean value was 3.56 ± 0.73, with a slight decrease from the previous visit but still with a significant increase from the preoperative value. After 9 months the mean value became 4.07 ± 0.87, which was the highest value during the first year and with a significant increase as well. After 12 months the mean value was 3.66 ± 0.83 with a slight decrease compared with the previous visit but still with a significant increase from the preoperative value [Figure 1], [Figure 2], [Figure 3], [Figure 4], [Figure 5], [Figure 6], [Figure 7], [Figure 8], [Figure 9]. Figure 1: Type of operation. Figure 2: Percentage of complications. Figure 3: Distribution of accessory splenules. Figure 4: Distribution of postoperative discharge. Figure 5: RBC count preoperatively and 1 year after splenectomy. Our patients were followed up for 1 year as follows: after 1 month, followed by at 3-month intervals for 1 year (at 1, 3, 6, 9, and 12 months). All patients had complete blood count on follow-up. All patients showed an improvement in hemoglobin and hematocrit levels. Also, all the blood elements – RBCs, white blood cells, and platelets – showed a significant increase after splenectomy in all patients. The mean RBC count in the first month follow-up was 3.86 ± 0.78 (t-test = 19.105), which shows a significant increase in the RBC count in the first month after the operation. After 3 months the mean value of RBCs was 3.94 ± 0.72, which shows another significant increase from the previous follow-up visit. After 6 months the mean value was 3.56 ± 0.73, which was a slight decrease from the previous visit but still significantly higher than the preoperative value. After 9 months the mean value became 4.07 ± 0.87, which was the highest value during the first year and with a significant increase as well. After 12 months the mean value was 3.66 ± 0.83, which was a slight decrease from the previous visit but still significantly higher than the preoperative value. RBC, red blood cell. 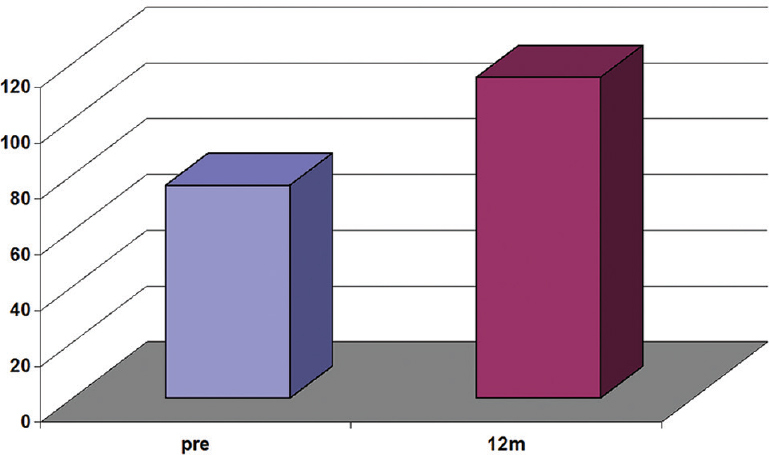 Figure 6: WBC count preoperatively and after 1 year. The mean WBC count in the first month follow-up was 11.19 ± 5.58 (t-test = 7.56), which was a significant increase from the preoperative value. After 3 months the mean value of WBCs was 25.84 ± 12.65, which was another significant increase from the previous follow-up visit. After 6 months the mean value was 29.94 ± 11.93, with a greater increase than the previous visit and with a significant increase from the preoperative value. After 9 months the mean value became 14.09 ± 6.90, which was a slight decrease from the previous visit but still with a significant increase from the preoperative value. After 12 months the mean value was 22.54 ± 11.04, with a significant increase from the preoperative value. WBC, white blood cell. 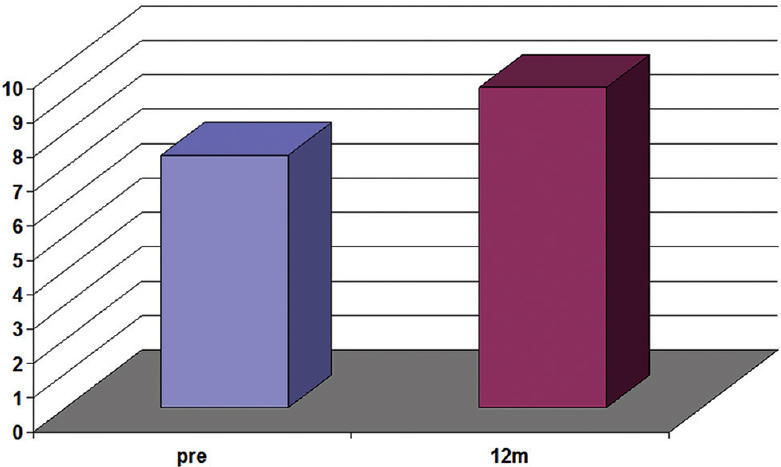 Figure 7: Platelets count in preoperative and after 1 year. The mean value of platelets count in the first month follow-up was 226.80 ± 165.55 (t-test = 5.271) which shows a significant increase in the platelets count in the first month after the operation. After 3 months the mean value of platelets was 98.47 ± 59.93 which shows a slight decrease than the last visit but still with significant increase more than the preoperative value. After 6 months the mean value was 105.3 ± 66.30 with a slight increase from the previous visit and still with a significant increase more than the preoperative value. After 9 months the mean value became 205.83 ± 148.52 with increasing value and a significant increase more than the preoperative value as well. After 12 months the mean value was 114.93 ± 82.00 with a slight decrease than the previous visit but still with a significant increase at last than the preoperative value. 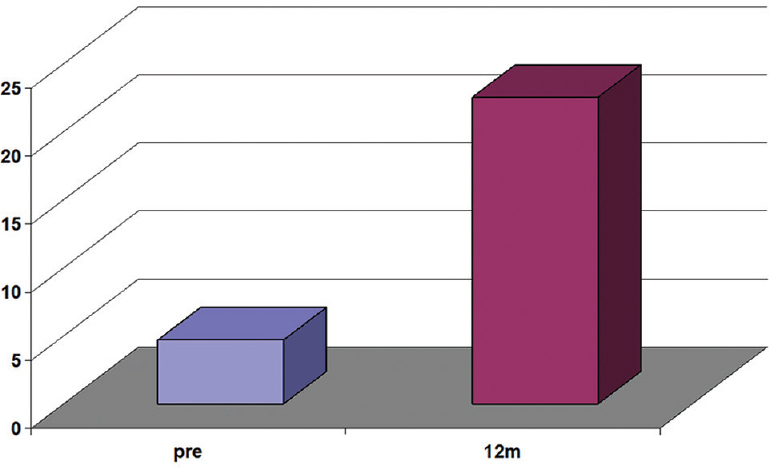 Figure 8: HCT value preoperatively and after 1 year. The mean HCT level in the first month follow-up was 23.85 ± 5.2 (t-test = 6.954), which was a significant increase after the operation. After 3 months the mean HCT level was 26.56 ± 4.56, which was another significant increase from the previous follow-up visit. After 6 months the mean value was 25.10 ± 4.66, with a slight decrease from the previous visit but still significantly more than the preoperative value. After 9 months the mean value became 29.00 ± 7.33, which was the highest value during the first year and with a significant increase as well. After 12 months the mean value was 26.99 ± 6.86, with a slight decrease from the previous visit but still with a significant increase from the preoperative value. HCT, hematocrit. 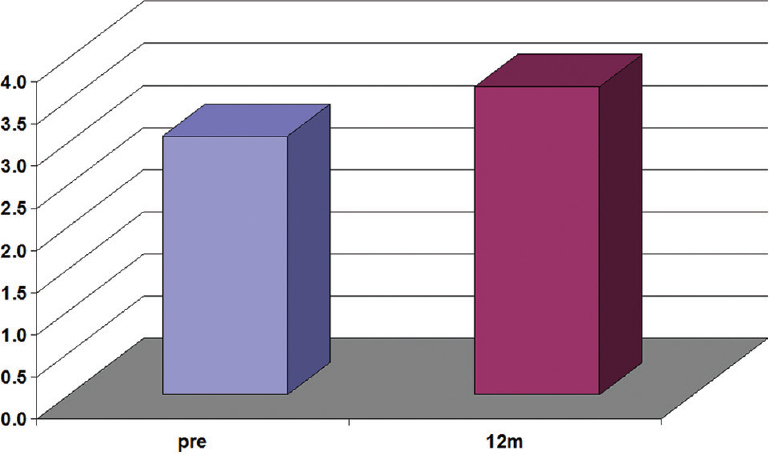 Figure 9: HB value preoperatively and after 1 year. The mean HB level in the first month follow-up was 8.49 ± 1.52 (t-test = 9.179), which was a significant increase from the preoperative level. After 3 months the mean HB level was 8.76 ± 1.49, which was another significant increase from the previous follow-up visit. After 6 months the mean value was 8.04 ± 1.59, with a slight decrease from the previous visit but still significantly higher than the preoperative value. After 9 months the mean value became 9.88 ± 1.93, which was the highest value during the first year and with a significant increase as well. After 12 months the mean value was 9.31 ± 1.79, which was a slight decrease from the previous visit but still significantly higher than the preoperative value. HB, hemoglobin. Thalassemias are one of the most common inherited hematological disorders. Today thalassemia remains a major health problem throughout the world . This clinical study was undertaken at Mansoura New General Hospital and Oncology Center of Mansoura University. A total of 15 patients were considered who were admitted with thalassemia major with various complaints and operated upon (splenectomy) during the study. In our series, the patients were aged between 17 and 32 years, with an average of 24.46 years. The reasons for the older age of our patients probably include delayed referral for splenectomy and unwillingness of patients to undergo major surgery. In our series, the male-to-female ratio was ∼6: 4, a finding similar to the series by Porecha et al. who had a ratio of 7: 3. The major indication for splenectomy in our patients is higher blood transfusion requirement. In our series, the minimum preoperative blood transfusion requirement was 250 ml/kg/year and the maximum was 320 ml/kg/year, with an average of 279 ml/kg/year. In a similar study by Chaudhary and colleagues, the blood transfusion requirement was 180–200 ml/kg/year. The frequency of blood transfusion in our study was 1 U in 1 month . In this study HB showed a significant increase from a preoperative mean value of 7.34–9.31 after 1 year. HCT also increased from 22.36 preoperatively to 26.99 after 1 year. These results are similar to those of other studies like Khalid et al. and Wahidijat et al. , with significant increase in the first year after splenectomy. In this study WBCs also showed a significant increase from a preoperative mean value of 4.71–22.54 after 1 year, with results similar to those of Abdel Aziz, which was 5.36 before the operation and 28.6 after 1 year. In contrast, in the study by Ammar and colleagues, there were no significant differences in T-lymphocyte populations between the two groups. Immunoglobulin M memory B-lymphocytes were lower in the splenectomized group compared with that in the nonsplenectomized group. No overwhelming postsplenectomy infection was reported in this series ,. Laparoscopic splenectomy was the most common approach used in our study, in 53.3% of patients, whereas midline incision was used in the rest of our patients– that is, in 46.7%. This is the safest and most effective incision, considering good exposure and easy closure in the open technique. Good exposure allows for easy and early identification of the splenic artery and better space for mobilization of the spleen; it also helps to prevent injury to surrounding organs. The time taken for closure is also reduced and thus overall wound complications are reduced. Porecha and colleagues advocated left paramedian incision in his series as the better method, whereas Bowdler believes that laparoscopic splenectomy is the ideal technique. Thus, recent literature has advocated laparoscopy ,. The spleen clearly serves very important hematological and immunological functions . Elective splenectomy is indicated in the management of a wide variety of medical disorders . In patients with thalassemia, there is an increased rate of RBC removal by the spleen; therefore, RBCs, HB, HCT, and RBC indices are elevated after splenectomy. Transfusion frequency, and its subsequent complication, is expected to be reduced after splenectomy. In this study, despite the significant increase in HB level after splenectomy, the reduction in blood transfusion frequency did not reach statistical significance. In splenectomized patients, blood transfusion is needed every 34 days on average . The term OPSI (overwhelming postsplenectomy sepsis) defines fulminating sepsis, meningitis, or pneumonia mainly caused by encapsulated bacteria, such as pneumococci, meningococci, and H. influenzae type b. Characterized by evolution in just a few hours, in association with hypotension, alteration of consciousness, or shock, OPSI is a major concern after splenectomy, with a high mortality risk of 40–50% . Thrombosis following splenectomy has been reported in the literature . Splenectomy leads to immediate reactive thrombocytosis and an increase in circulating microparticles, with an increased risk for subsequent venous thromboembolism, particularly within the splenoportal system . In the literature, the incidence of postsplenectomy portal vein thrombosis ranges from 0.7 to 8%; patients usually present with fever and abdominal pain . Since the introduction of laparoscopic splenectomy in 1991, it has evolved as a standard treatment for benign diseases with normal-sized spleens . In thalassemia, splenectomy is reserved for patients with marked symptoms related to the extent of splenomegaly, increased transfusion requirements, and complications such as pancytopenia. Splenectomy should not be undertaken lightly and the risks should be weighed against the potential benefits in each individual case. Most of this risk seems to be due to the underlying splenectomy indication and not due to splenectomy alone . Some authors believe that splenectomy should be performed as soon as increased transfusion requirement appears, before hypersplenism or hemosiderosis becomes apparent . Rashidy et al. believe that splenectomy is the principal surgical procedure for many patients with β-thalassemia, as the spleen increases RBC destruction and patients are no longer able to maintain adequate HB level because of hypersplenism. Al Hawsawi et al. published a series with splenectomy in thalassemia patients and the benefits of splenectomy were found to be unequivocal by one and all. Others believe that the decision to recommend splenectomy is based on transfusion requirements. Splenectomy is usually not recommended because of its limited therapeutic value and inordinately high operative risk . The study included 15 patients having thalassemia major on whom splenectomy was performed. From this study we concluded that thalassemia patients do suffer from splenomegaly because of extramedullary hematopoiesis, increased RBC destruction, repeated blood transfusions, and iron overload. Splenectomy is indicated if there is increasing blood transfusion requirements, gross splenomegaly causing hypersplenism, or pressure symptoms on surrounding organs. Splenectomy definitively reduced blood requirements from twice every month preoperatively to less than once/month, and improved HB levels. These improvements are sustained over a prolonged period of time. Preoperative vaccination definitely needs to prevent postoperative OPSI and other infective complications. Routine use of penicillin also helps to reduce postoperative infective complications. Patients improved after splenectomy because of improved HB level. Patients felt less fatigue and were able to carry out their daily activities in a better way. Decreasing blood transfusion requirements helped them reduce hospital visits. The cost of iron-chelating therapy was also reduced. Most patients had improved school attendance and better academic performance. Their family members also benefited because of decreased hospitalization. Therefore, we strongly recommend that, as splenectomy improves HB level and decreases the blood transfusion rate, surgery should not be withheld if indicated. Rivella S. Ineffective erythropoiesis and thalassemias. Curr Opin Hematol 2009; 16:187–194. Bernadette M, MatthewD. Global epidemiology of haemoglobin disorders and derived service indicators. Bull World Health Organ 2008; 86:480–487. Wambua S, Mwangi WT, Kortok M, Uyoga MS, Macharia WA, Mwacharo KJ, et al. The effect of thalassaemia on the incidence of malaria and other diseases in children living on the coast of Kenya. Nat Genet 2006; 37:1253–1257. Di Marco V, M Capra. Management of chronic viral hepatitis in patients with thalassemia. Blood 2010; 116:2875–2883. Taher AT, Musallam KM, Cappellini MD, Weatherall DJ. Optimal management of beta thalassaemia intermedia. Br J Haematol 2011; 152:512–523. Crary SE Buchanan GR. Vascular complications after splenectomy for hematologic disorders. Blood 2009; 114:2861–2868. Pecorari L, Savelli A, Guna CD, Fracchia S, Borgna-Pignatti C. The Role of Splenectomy in Thalassemia Major. An Update. Acta Pediatrica Mediterranea. 2008;24:57–60. Chaudhury N, Samanta N, Bose S, Maity CR. Prospect of splenectomy in thalassemia. Indian Pediatr 1994; 31:988–991. Khalid AO, Yaser AL, Naif R, Tarig AS. Splenectomy in thalassemia. J Arab Board Med Specializations 2006; 8:339-343. Wahidijat I, Markum AH, Adang ZK. Early splenectomy in the management of thalassemic children in Djakarta. Acta Haematol 1972; 48:28–33. Ammar SA, Elsayh KI, Zahran AM, Embaby M Splenectomy for patients with β-thalassemia major: long-term outcomes. Egypt J Surg 2014; 33:232–236. Abd El-Aziz TB. Splenectomy in Egyptian thalassemics, correlative study of different phenotypes with their genotype [thesis]. Mansoura, Egypt: Department of General Surgery, Faculty of Medicine, Mansoura University; 1991. Bowdler AJ. The complete spleen: structure, function, and clinical disorders. Can J Surg 2002; 45:226. Weledji EP. Benefits and risks of splenectomy. Int J Surg 2014; 12:113–119. Neunert C, Lim W, Crowther M, Cohen A, Solberg L Jr, Crowther MA, American Society of Hematology. The American Society of Hematology 2011 evidence-based practice guideline for immune thrombocytopenia. Blood 2011; 117:4190–4207. Langley JM, Dodds L, Fell D, Langley GR. Pneumococcal and influenza immunization in asplenic persons: a retrospective population-based cohort study 1990–2002. BMC Infect Dis 2010; 10:219. Rodeghiero F, Ruggeri M. Short- and long-term risks of splenectomy for benign haematological disorders: should we revisit the indications?Br J Haematol 2012; 158:16–29. Boyle M, Mahawar K, Balupuri S, Small P. The relationship of distance from the surgical centre on attendance and weight loss after laparoscopic gastric bypass surgery in the United Kingdom. Clin Obes 2013; 3:180–184. Frey PM, Méan M, Limacher A, Jaeger K, Beer HJ, Frauchiger B, et al. Physical activity and risk of bleeding in elderly patients taking anticoagulants. J Thromb Haemost 2015; 13:197–205. Van't Riet M, Burger JW, van Muiswinkel JM, Kazemier G, Schipperus MR, Bonjer HJ. Diagnosis and treatment of portal vein thrombosis following splenectomy. Br J Surg 2000; 87:1229–1233. Wang KX, Hu SY, Zhang GY, Chen B, Zhang HF. Hand-assisted laparoscopic splenectomy for splenomegaly: a comparative study with conventional laparoscopic splenectomy. Chin Med J (Engl) 2007; 120:41–45. Rashidy FH, Abo Elghar HM, Kamal Eldin SM, Taha MZ. Hepcidin and iron regulation in chronic hemolytic anemia. Menoufia Med J 2015; 28:463–470. Al Hawsawi ZM, Hummaida TI, Ismail GA. Splenectomy in thalassaemia major: experience at Madina Maternity and Children's Hospital, Saudi Arabia. Ann Trop Paediatr 2001; 21:155–158.